WDR Premiere of 'Action Hero' for recorded Schwarzenegger & Orchestra. Recently I was in Cologne for the premiere of my new piece Action Hero for recorded Schwarzenegger and orchestra. Here it is performed by the amazing WDR Funkhausorchester and conductor Frank Strobel. I was thrilled that the Queensland Symphony Orchestra, under their music director Alondra de la Parra premiered my new work, 482 Variations on a Very Short Theme. Natural Selections is a work for turntables, projector and orchestra inspired by sounds and images of the natural world. Tom and I were super pumped to perform Thum Prints at the BBC Proms Australia with the Queensland Symphony Orchestra at Hamer Hall, Melbourne. This was the QSO's first performance outside of QLD in its entire history. A big deal! The concert was live across Australia on ABC Classic FM and delayed on BBC. Last year I interviewed renowned theatre and opera director Peter Sellars while he was in Brisbane for his new dance theatre show FLEXN. I asked him about music and audiences. Graham Ross conducts The London Mozart Players and The Portsmourh Grammar School Chamber Choir. This work for orchestra and choir is a setting of the famous Wilfred Owen WW1 poem. The choir is a column of soldiers: ‘Bent double, like old beggars under sacks, Knock-kneed, coughing like hags, we cursed through sludge’. A gas attack sends them into a spiral of confusion as one man dies ‘guttering, choking, drowning.’ The organ only enters near the end, after the man has died, and a solo soprano (an ‘innocent tongue’) sings the titular text in latin. Of course its meaning – ‘sweet and noble it is to die for country – is intended to be scathing and ironic. The organ music sounds deformed: a sunken instrument in some bombed out church nearby – only “half beautiful”. The T’ang – with their fresh approach to programming and interpretation – have an expanded vision of the string quartet. Purchase the score to Baby Shark. Sung here by The Australian Voices at Hobart Festival of Voices. For Suzie Miller’s adaptation of Euripides’ Medea (produced by La Boite Theatre Company and directed by Todd MacDonald), the team and I have taken an exciting creative leap and incorporated a completely-sung ‘Greek' Chorus. I’ve plucked four singers from the ranks of my vocal ensemble The Australian Voices. The work is Thum Prints, and the beatboxer is Tom Thum, a magnificently-talented dude with an inexhaustible vocal inventory of glorious and weird noises. I’m pretty excited about this… The Queensland Symphony Orchestra (QSO) are apparently letting me have another go at them. 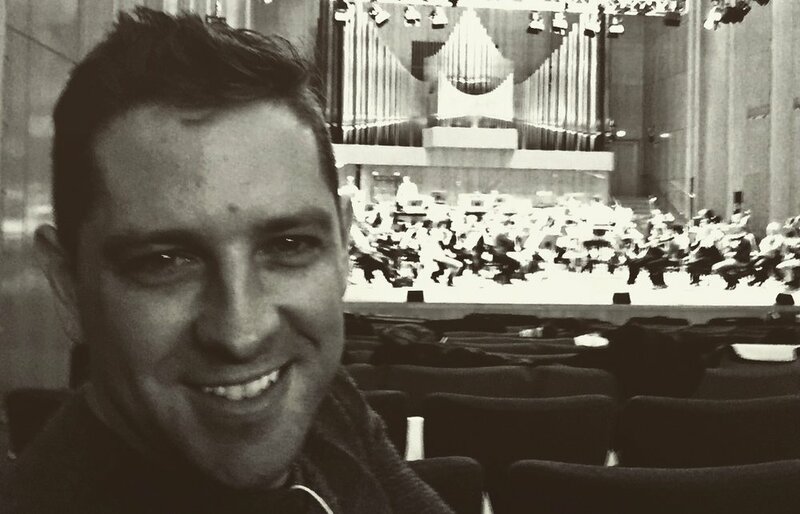 I composed a piece for them this year called Ghosts in the Orchestra, where I get a bunch of singers from my choir The Australian Voices (TAV) to stand among the orchestral players and sing instructions at them. The instructions get unrolled into little symphonic miniatures. Berlioz was so obsessed with Harriet Smithson that he wrote her a symphony. She married him, only after hearing a Symphony he composed for a second(!) woman he was obsessed with. This is a little radio thing I made.